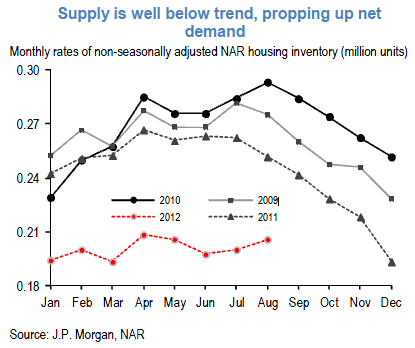 US residential housing supplies remain at multi-year low levels. The inventories of unsold homes as measured in months (time to clear the inventory) are at the lowest level since 2006. To put things in perspective, here is what the situation looks like compared to the previous 3 years. 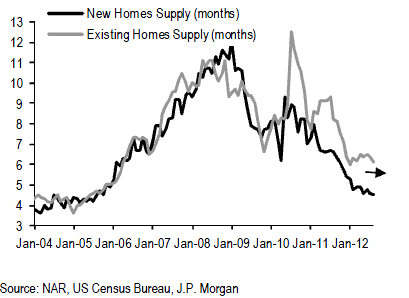 This supply of homes is constrained by weak residential construction. 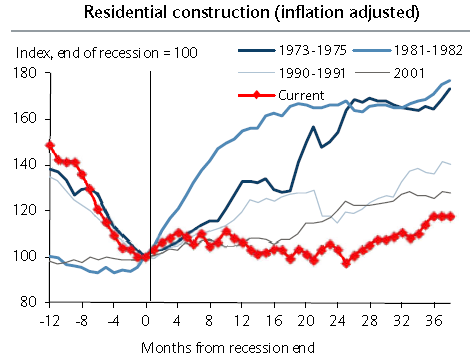 The chart below compares residential construction growth in the US to previous recoveries. This is starting to stabilize prices even in areas that have witnessed relentless house price declines, such as Southern California. What's interesting is that we are seeing a shift from the heavily discounted or distressed sales to the more normal "move-up properties". DQ News: - La Jolla, CA---The median price paid for a Southern California home rose again in September to a more-than-four-year high, the result of affordability-driven demand meeting a modest supply of homes for sale, and a big change in market mix. For the first time in nine months sales declined compared with a year earlier as low-end deals fell and foreclosure resales hit a nearly five-year low, a real estate information service reported. The median price paid for a home in the six-county Southland climbed to $315,000 last month. That was up 1.9 percent from $309,000 in August and up 12.5 percent from $280,000 in September 2011, according to San Diego-based DataQuick. Last month’s median price was the highest since the median was $330,000 in August 2008. The Southland median has risen month-to-month for eight consecutive months and has increased year-over-year for the past six months. The median sale price has risen mainly for two reasons. First, higher demand, triggered largely by ultra-low mortgage rates, has coincided with a dwindling supply of homes for sale. Second, there’s been a big change in the types of homes selling this year. Far fewer are heavily discounted foreclosures, and many more are mid- to high-end move-up properties.